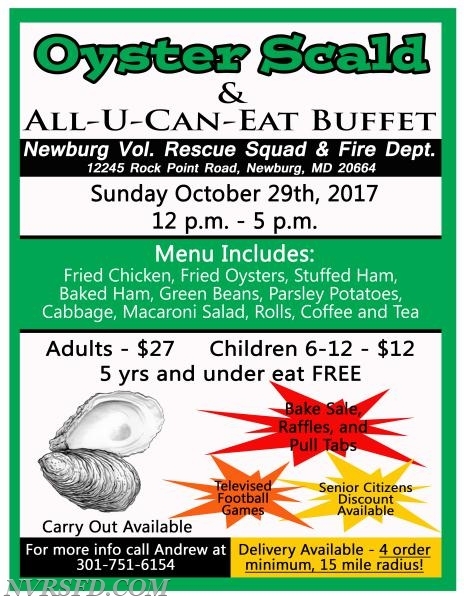 On Sunday October 29th, 2017 the Newburg Volunteer Rescue Squad and Fire Department will hold it's annual Oyster Scald and All-U-Can-Eat Buffet! The cost is $27 per person for the adult buffet, $12 for children 6-12, and kids 5 and under eat free (carryout is also available)! $10 per bucket of Oysters for the scald. The buffet includes: Fried Chicken, Fried Oysters, Stuffed Ham, Baked Ham, Green Beans, Parsley Potatoes, Cabbage, Macaroni Salad, rolls and coffee/tea. There is a senior citizens discount available, pull tabs for sale, raffles and more! There will also be televised football games! For more info, visit our website at www.nvrsfd.com or call Andrew at 301-751-6154.